This is a really fun and easy craft project for adults and kids and they look so lovely. 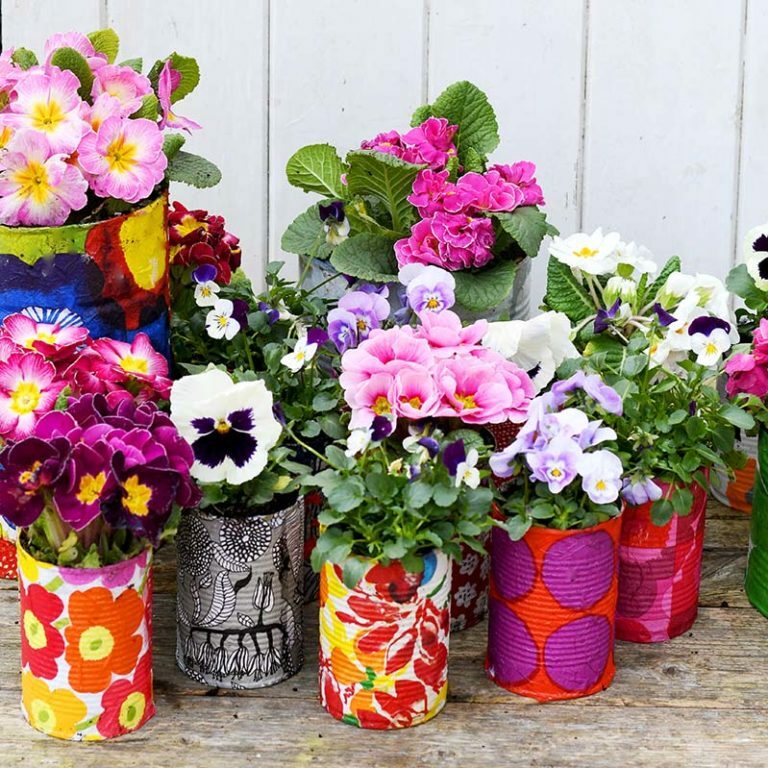 You can use these upcycled tin cans as vases or pen pots, or to plant up herbs on your windowsill. 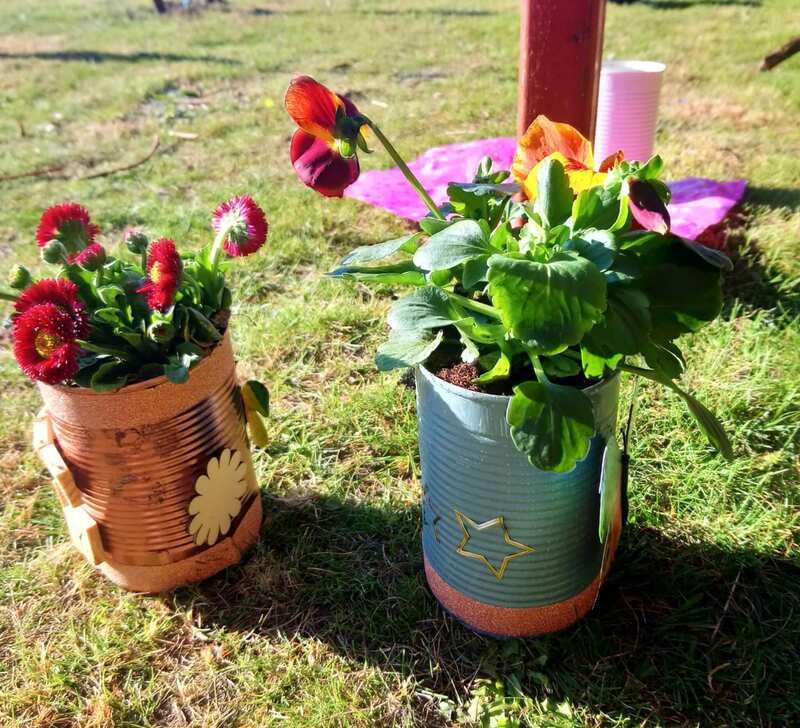 We made them as Mother's Day gifts and filled them with pansies and other flowers to go on tables. First - give your empty cans a good rinse, dry them and then paint them white. Any old white paint will do – I used an emulsion paint my neighbour had left over. If you want to incorporate the base colour in your design and not add too much on top, you can use a coloured paint - I played with some sage and blue paints - or spray paint the tins, copper looks really good. Watch out for sharp edges on the inside of the tin - I used a chisel file to smooth edges before painting. The next step is to cover the outside of the can in Modge Podge craft glue or other decoupage glue. You then lay it on top of a strip of decopatch paper or a patterned napkin, cut to the right size and length. We used Marimekko design napkins I got from eBay and some decopatch papers from Hobbycraft and eBay. You need to peel off the top patterned layer of the napkin so that it’s thin enough to use. If you lay the glued can on it and roll it along the paper, you get a more even surface than trying to stick the paper on with the can upright. Apply another thin layer of Modge Podge all over to seal it and add other bits to decorate. We used wooden scrabble letters and flowers attached with glue dots, magnetic butterflies, and colour-co-ordinated washi tape to create striped effects or around the tops and bottoms of the cans to create a neat edge. You can also cut out images of flowers/birds/nature from magazines and add them on top using Modge Podge under and over the images (like the ones in this photo). You can really let your imagination run wild with these and it's such a great way to reuse tin cans. If you want them to be proper planters, you will need to drill drainage holes in first and have a dish underneath. These aren’t meant for outdoors use as the cans will rust. Let me know if you have a go at making some of these, I'd love to see your designs!